Introducing Mr. and Mrs. Married! After tying the knot in two highly-anticipated ceremonies over the weekend, Nick Jonas and Priyanka Jonas are officially husband and wife. 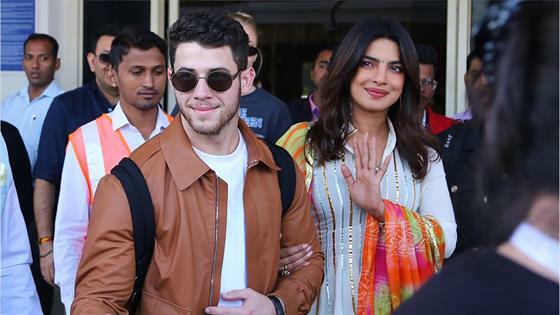 While pictures of the beloved couple on their big days have been kept under wraps, the newlyweds were all smiles as they posed for paparazzi at Jodhpur airport on Monday after their whirlwind weekend. As such, they were the first photos of the lovebirds as a married pair. The couple was the image of wedded bliss as they embraced in front of photographers. The beautiful bride donned a turquoise and gold sari by Sabayasachi and Celine shades while the handsome groom opted for a matching khaki jacket and trousers by Ermenegildo Zegna Couture with Westward Leaning sungasses. While it's unclear what their honeymoon plans are at the moment, the weekend was certainly one they will never forget. Embracing both Chopra's Indian background and Jonas' Christian upbringing, the couple merged their traditions for a week of spectacular joint festivities. Ahead of the wedding ceremonies, the couple celebrated with a Puja ceremony, followed by a Mehendi for Priyanka, where henna tattoos were applied to her feet and hands. The two families united for a show-stopping Sangeet dance-off, featuring participation from the other famed Jonas brothers, Kevin Jonas and Joe Jonas. Soon, it was finally time for the two main events at the Taj Umaid Bhawan Palace in Jodhpur. The couple sealed the weekend—and kicked off their new life together—with a Christian ceremony on Saturday, officiated by the groom's father Paul Kevin Jonas Sr., followed by a Hindu ceremony on Sunday.